The hand pump water supply is perfect for the user who has 1 or 2 vehicles, (golf car, pallet jack, etc.) and would like to use distilled water. 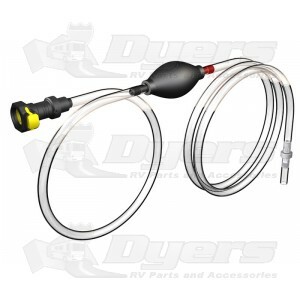 Squeeze bulb filler for use with Pro-Fill RV and Qwik-Fill battery watering system. To operate, simply connect the hand pump to your Pro-Fill system and place the other end in a gallon of distilled water. Begin to fill by squeezing the pump. When all of your batteries are filled, the bulb will become firm, not allowing you to add any more water. Hand Pump filler for use with Pro-Fill RV Edition and Qwik-Fill onboard battery watering systems. Includes squeeze bulb filler, intake filter, quick disconnect and tubing. This is an exact replacement for one that only lasted 3 years. The rubber bulb cracked and split on the old one. Hopefully this one will last much longer. Great useful product, a little pricey for plastic but, wow it sure does away with uncomfortable position asssumed during check and filling. I have a four battery pull out tray and the back two are a buger. Now hook up the buld hose squeeze and bingo all is done, get it DONE. Buyers should be aware that the Flow Rite design was changed about 3 years ago. The small grey quick disconnect (feeding the Batteries) no longer marries up to the much larger Black and yellow quick disconnect. I called Flow Rite since I had lost my old pump and couldn't exchange my old male disconnect. They were extremely nice and provided me with the new male connector. I've been using a Flow Rite battery filler system for 5 years. There is no question that the Flow Rite approach is the only way to service your coach batteries. I do believe that servicing your battery water levels monthly can extend your battery life. I recently changed 4 house batteries after 6 yrs 11 months. Works as advertised, with the flow rite watering system. Really makes battery maintenance a whole lot easier.